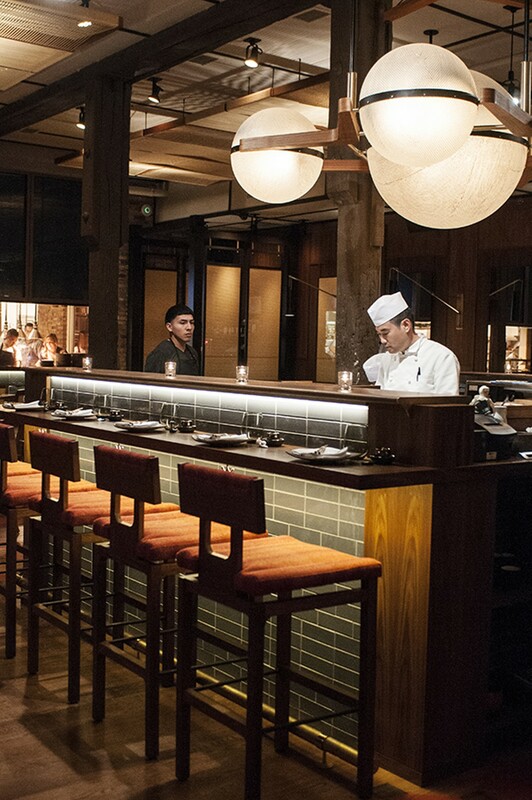 The Boka group brings most of Japan to the West Loop. I don't know how many visits it would take to truly feel comfortable ordering in a place like Momotaro, the triple-decker Japanese behemoth from the Boka group (which seems incapable of opening an unsuccessful restaurant). I visited a few times, and when I go back again I'll still probably dither anxiously over the seven-page menu. It's a lot to take in, divided among snacks, cold and hot appetizers, skewers from the robata grill, items brought to the table on live hibachi grills, a seasonal category titled (for now) "autumn," and, from the sushi side of the operation, donburi, sashimi, makimono, nigiri, and a separate "chef selection nigiri." It's a sign of remarkable restraint that there's no ramen. Servers apologize for the overwhelming scope, and if you're charitable you'll sympathize with their struggle to help diners plan a coherent meal. It isn't easy. Momotaro isn't the first to try this not-strictly-traditional omnibus approach to Japanese food—an approach I can't help but be suspicious of. Yet Masaharu Morimoto's recent reboot of Japonais is similar in this way, and there's not much to dislike about it. Maybe the resemblance is more than coincidental. As with all of their projects, Boka principals Kevin Boehm and Rob Katz have distinguished themselves by attracting exceptional talent. One of the two chefs they've brought in to launch Momotaro recently did development work for Morimoto's Philadelphia-based restaurant group. That chef, Mark Hellyar, is in charge of whatever comes out of the glassed-in kitchen in the rear of the restaurant, rather than the centrally located wraparound sushi bar at its center. 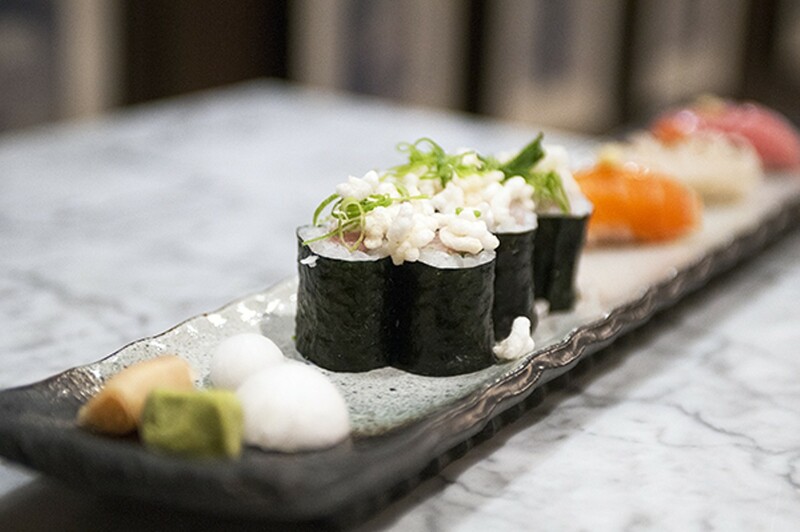 The line between austere, simple Japanese food and modern, often irreverent innovation is pretty thin on both sides of the menu at Momotaro. That's why you'll see things like the signature "Momotaro tartare," made from the minced and dehydrated flesh of the sweet and tangy Japanese tomato variety that, like the restaurant, takes its name from the folk hero who landed on earth inside a giant peach. Served with some shrimp chips and a moderating dab of Maui onion puree, the tartare is saturated with glutamates, and except for its concentrated sweetness is a fair approximation of both the texture and taste of raw beef. The Japanese obsession with itameshi, or Italian food, results in two superb mashups. 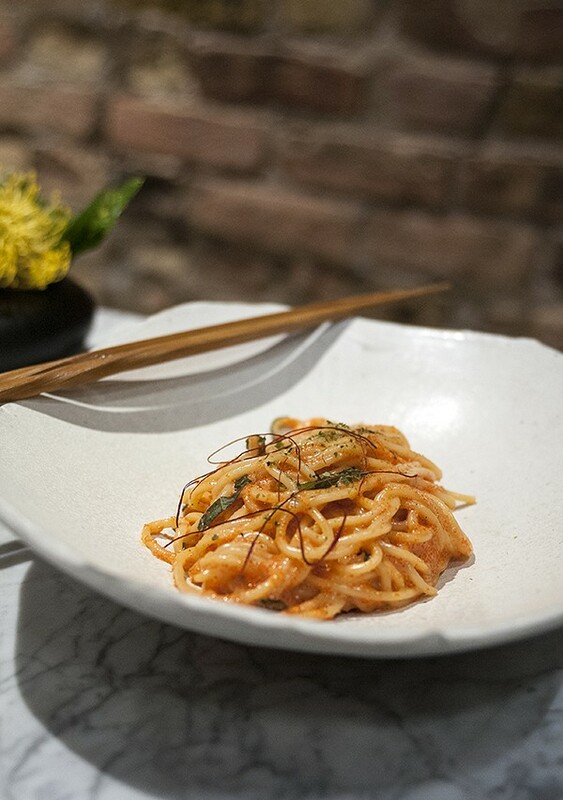 One, a spool of spaghetti enriched with the egg of the free-range Jidori chicken, is tossed with tiny, spicy pollock roe that act as a delicate abrasive on the tongue. The other, a risotto-like pool of creamy, vividly orange-colored uni rice, is topped with a generous application of black truffle slices that perfumes the table's orbit with a fungal ambrosia. 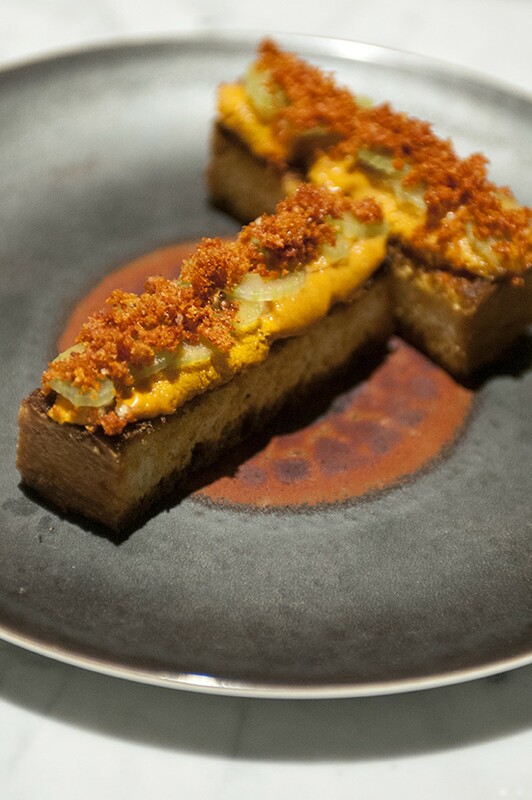 Uni appears on the menu seven times in similarly luxurious capacities. But such richness isn't limited to blatant cross-cultural experiments. The silky egg custard chawanmushu gets drenched in a murky truffled sauce with a dollop of sweet crabmeat in the middle. Extravagant accents like that pop up all over the menu. From the robata, a tiny scrap of skirt steak from a mixed Wagyu/Black Angus breed is wrapped around a morsel of foie gras, anchored in place by two blistered shishito peppers. 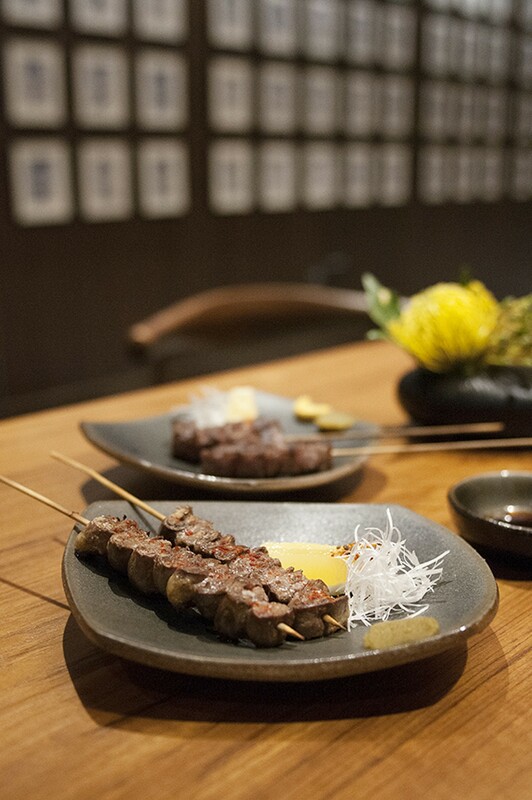 A fat chunk of Wagyu tongue has its impossible richness cut by dabs of searing Japanese mustard and fermented yuzu chile paste, just as they do with a skewer of chewy chicken hearts stacked on the stick like war trophies, and gingery, elongated chicken meatballs topped with perfectly circular formations of two sunny-side up quail eggs. For now the seasonal "autumn" section of the menu is composed of a handful of dishes including a steaming bowl of porky curried udon noodles; a dramatic, simmering tableside presentation of Wagyu sukiyaki; and snapper, mushrooms, and daikon braised in a sweet shoyu broth that tastes exactly like the wintry stew oden. Momotaro's sushi chef, Jeff Ramsey, who did time at Tokyo's Michelin-starred seven-seat Tapas Molecular Bar, doesn't seem to have applied many of that restaurant's modernist tendencies to the fish, but he does have his Achatz moments, as with the presentation of a pair of mackerel nigiri accompanied by a sudden whiff of burning Cypress sawdust. I made fun of a similar gimmick when I reviewed Juno, but it made sense in this instance, the piney smoke complementing the rich, oily fish. It doesn't get much more experimental than that. Other special nigiri have subtle but interesting touches. Appreciation for a lean, bland fish like fluke might be bolstered by a topknot of fish concealing a morsel of sumptuous monkfish liver. The light sear on a piece of squid is a nice touch, but it likely has little to do with the surpassingly tender, almost weirdly creamy texture of the flesh. Otherwise unadorned nigiri are painted with a shiny glaze of sweet soy sauce, a traditional touch not often practiced in these parts. Makimono are similarly restrained and not unlikably adorned. Chopped yellowtail is given textural variety with a sprinkle of puffed rice that doesn't interfere with the fish. A strong specimen like mackerel is sprinkled with a bracing herbal mix that includes wasabi root and leaf, shiso, sesame seeds, and mint. A shiny, jewel-like square of tuna shelters a roll filled with chopped octopus, crowned with a pinky-nail-size circle of pickled lotus root—it's cute, and it doesn't get in the way. While on the whole the fish is very good at Momotaro, it's occasionally handicapped. 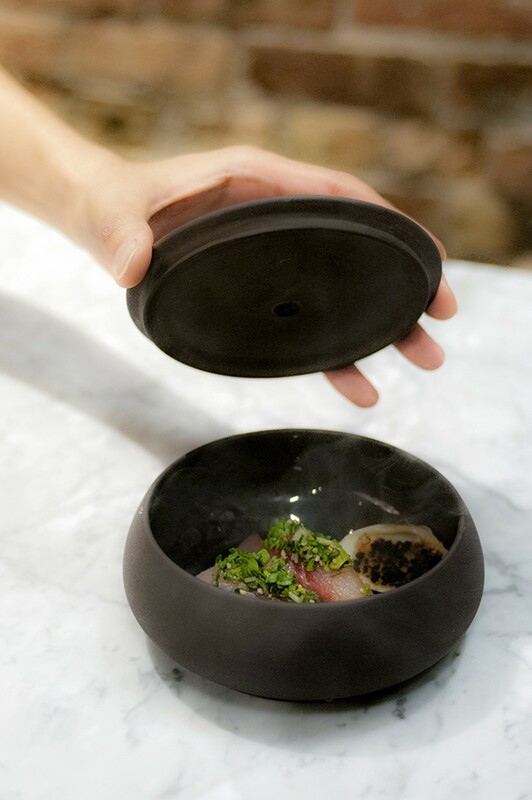 For instance, the sashimi omakase, though beautifully presented atop a tureen of crushed ice, is just too cold to express the fish's full potential. But overall, come into Momotaro with a focus on fish; you won't do poorly at all. 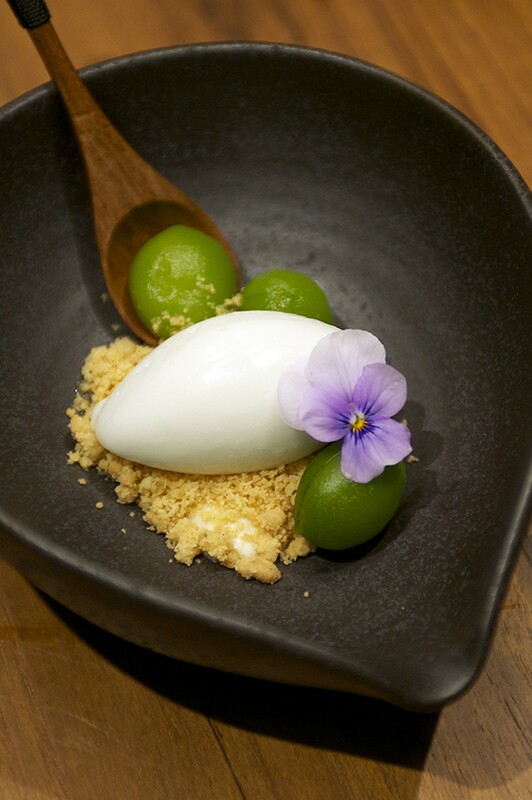 After all that, the dessert section is mercifully brief, just four options including a quenelle of cool sorbet surrounded by baby green peaches that can be consumed pit and all, and a dense soy custard concealing a layer of huckleberry jam. I've only scratched the surface here. There are plenty of other diversions at Momotaro: a fine selection of Japanese whiskeys, beers, and sake in addition to wine and cocktails, and a subterranean "izakaya" serving snacks such as tuna hand rolls, Jidori chicken gyoza, planks of toast topped with buttery uni and chorizo, and hollow diamond-shape crackers, aka "air bread," covered with glistening slabs of tuna. It's rare when a restaurant that tries to do so much—especially a Japanese restaurant—does very much well. But whatever sustaining magic the Boka group has tapped into, it's helped them open a rare place indeed. Michael Gebert heads to the burbs to eat highly authentic Japanese food with Momotaro's Scott Malloy. 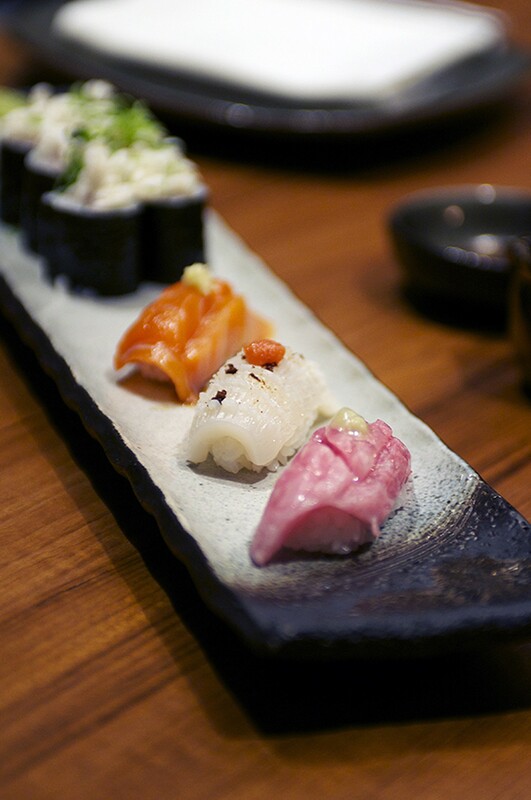 A visual tour of what's on offer at the Boka Group's new sushi bar.